Before I start the guide, let’s have a round-up of jargons I will be using throughout the guide. A core concept of software programming wherein software creates multiple threads having execution cycling. 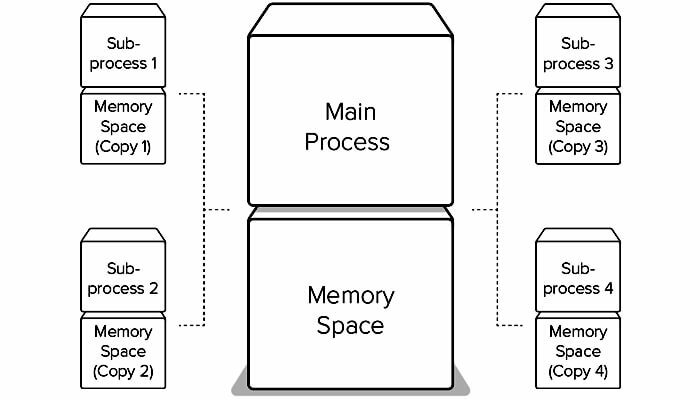 The single set of code can be used by several processors at different coding stages. In software programming, a thread is the smallest unit of execution. What does a thread in Python mean? In software programming, a thread is basically a task. The thread offers a way to programmers to add concurrency to the programs. A process or a task can execute multiple threads at a time known as multi-threading. How are Python multithreading and multiprocessing related? With the help of Python multithreading and multiprocessing, Python code can run concurrently. With the help of multiprocessing, codes can be made parallel. Python is just like any other programming language that has features and functionalities that any developer would love to embrace. However, the programing language does see a lot of criticism on the grounds of the fact that it is difficult to use Python for multithreaded work. Such discussions generally point the finger at the global interpreter lock or GIL. Global interpreter lock inhibits multiple threads of Python code from running simultaneously. With this reason, the Python multithreading module sometimes behaves unexpectedly for developers who do not have much information on Python. If interested in how logging from Python apps looks, check this page. Developers typically from Java or C++ background face much difficulties while choosing the same. 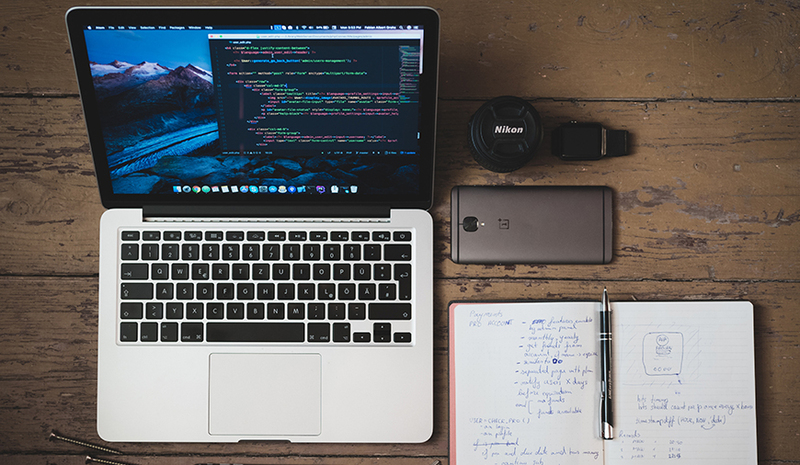 However, Python gives the advantage of writing the codes that are running concurrently or in parallel in order to make a great difference in the resulting performance. However, the developers need to take care of the certain things. This Python concurrency guide will feature a small Python script to allow downloading of popular images from Imgur (the online image-sharing community). I will start with a version that downloads image one at a time. For initiating, it is important to have a registered app on Imgur. In case, you have one, it’s great. In case, you lack such an app, create one and come along. I will be creating a Python module first, called download.py. This file will have all the prerequisites to fetch the list of images and to download the same. Let’s separate these functionalities into different functions as stated here. I will use the third functionality setup_download_dir to create a download destination directory in case there is none. Imgur’s API needs HTTP requests to take the Authorization header with the client ID. One can get this client ID from the dashboard of the application that was just registered on Imgur, and the response will be JSON encoded. Here Python’s standard JSON library can be used to decode it. Now, it comes to downloading and all that it requires is to fetch the image by its URL and write it to a file. The timings and the number of downloads used may vary depending upon the speed of a system. The speed of the downloads can be increased by introducing concurrency or parallelism. It will help to speed up the entire download time. For developer’s convenience, all of these Python scripts can be found in this GitHub repository. With the help of threading a Python developer can easily achieve Python concurrency and parallelism. Threading is most commonly provided by the operating system. 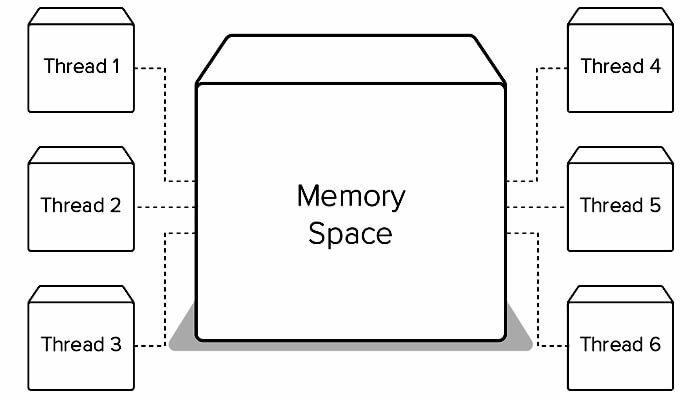 Threads are lighter if compared with processors and have same memory space. I will now write a new module to replace single.py in this Python threading example. The new module will have a pool of eight new threads plus the main thread and thus the new count will be nine threads. One can decide on the specific number of threads to produce. The new code is almost the same as the previous one with an exception that there is a new class DownloadWorker. This is a descendent of the Python Thread class. On every iteration, the class calls self.queue.get() in order to fetch a URL to from a thread-safe queue. It won’t proceed until there is an item in the queue to process. Once an item from the queue is received, it then calls the same download_link method. (the script that was used in the previous script to download the image to the images directory). Once the the download gets over, the worker signals the queue for finishing the task. The queue has the track of how many tasks were enqueued. When you call the queue.join() it would block the main thread. The thread would be blocked entirely forever if workers fail to signal when the task has been completed. It is worth mentioning that GIL is the reason because of which one thread was executing at a time throughout the process. And that makes the code concurrent and not parallel. And being an IO bound task, the code will run fast. The process will help to download the image easily also depending upon the the type of network you use. This is the reason Python multithreading can provide a large speed increase. Also, the process can switch between the threads whenever one of them is ready to do some work. The downside of using Python threading module or any other interpreted language taking support from GIL may result in performance reduction. In case, the performing code is a CPU bound task like decompressing gzip files, including the threading module will slower the execution time. Well, one can use multiprocessing module for executing CPU bound task for a real parallel execution. While the other reference Python implementation—CPython–has a GIL, but that won’t seem fit to all the Python implementation. For instance, IronPython, a Python implementation using the .NET framework lacks a GIL, and Jython as well, which is Java-based implementation. You can find a list of working Python implementations here. The multiprocessing Pool. is created to multiple processes. The map method will help to pass the list of URLs to the pool. As a result it will produce eight new processes and use each one to download the images in parallel. This is an example of parallelism, but it has an additional hidden cost along with it. The complete memory of the script is copied into each subprocess that is additionally produced. This is not a big deal. However, it can create a few issues for the developers. Threading and multiprocessing modules are great for scripts but the fact that you are running the same on your personal computer can’t be ignored. What in case if the entire work to be done on a different machine? What if you need to scale up to more than the CPU the machine can handle? A solution to this typical problem can be long-running back-end tasks for web applications. Running and spinning the bunch of threads on the same machine may degrade the performance of your app for the users, which is not at all an acceptable case. Therefore, it is a great idea to run the codes on another machine. For the same, you can take the help of an awesome Python library RQ. it’s a powerful library having functional codes for the users. Using the library users can enqueue a function and its arguments. This adds the function call representation. The functions are then appended to a Redis list. The very first job here is to enqueue the first step and we will require at least one worker for the same. Another job here is not only to install but also to run a Redis server on the system. And for the same get the access to a running Redis server. After that, we need to make some small changes to the existing code. 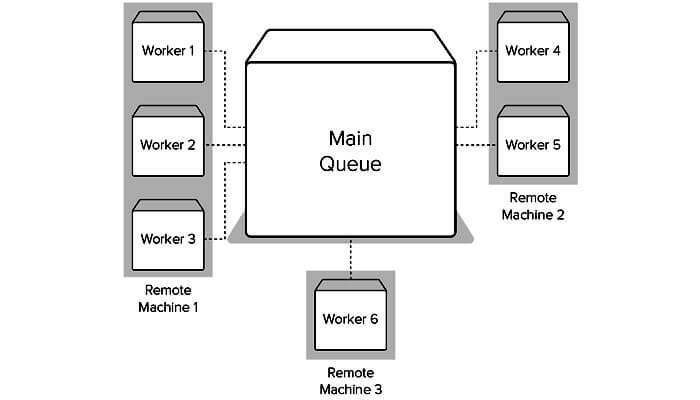 The prerequisite is to create a series of RQ queue to pass it an instance of a Redis server from the redis-py library. Then, instead of just calling the download_link method, we call q.enqueue(download_link, download_dir, link). When the job is executed completely, the arguments or the keyword arguments will be passed along easily. There are other Python job queue solutions available. However, we have used RQ as it is easy to use. For the codes having IO bound, both the processes including multiprocessing and multithreading in Python will work. Multiprocessing as explained earlier makes it easy to drop in threading but the downside associated is it has a higher memory overhead. In case the code is CPU bound, multiprocessing will seem a better choice. The cases when RQ is going to work better includes scaling the work across multiple machines when web apps are in use. We have not talked about Python concurrent.futures in the article here and the packages it offers along. The package is just useful when it is about using concurrency and parallelism with Python. The mentions in the article include that Python multiprocessing module seems easier to drop into existing code than the threading module. It was mentioned because of the fact that Python 3 threading module needed the subclassing Thread class along with creating a Queue for the threads to monitor the work. # will be called cleaning up threads. # all images must complete within 30 seconds. Now that we have all the required images with us downloaded with the Python ThreadPoolExecutor, we’ll now initiate to test the CPU-bound task. It depends whether you wish to develop the thumbnail versions of all the images in both a single-threaded, single-process script to test the multiprocessing-based solution. For resizing the image use Pillow library. The scripts call for iteration under the images folder and for the paths it runs a “create_thumbnail” function is created. This is an example on how functions use pillow to open images along with creating a thumbnail and saving the new, smaller images having similar name as the original but with an additional _thumbnail appended to the name. Let’s see if we can speed up the time it takes to run the script on images. # and returning a function of a single argument. The given method is identical to the last script. And the point of difference lies in developing ProcessPoolExecutor. We took the help from the executor’s map method to create the thumbnails in parallel. By default, a subprocess is created by the ProcessPoolExecutor one subprocess per CPU. This is all on the Python multithreading and multiprocessing!